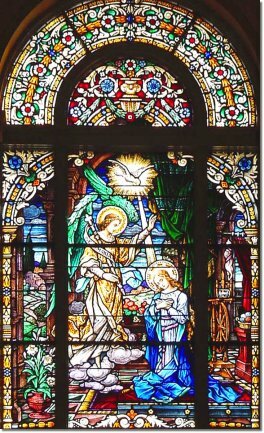 The archangel Gabriel appears to the teenage girl Mary, now about 14 years old, at her home in Nazareth, announcing that by the power of the Holy Spirit, Mary would conceive and bear a child and would call him Jesus. It was the greatest moment in the history of the world. With Mary's "yes", God became human (flesh) and entered into Mary's womb. It is interesting to note that in all of the Annunciation scenes, there is always a lily, a symbol of Mary's purity. Legend has it that the lily was formed from the tears of Eve as she was banned from the Garden of Eden. Hence the tear shaped lily. Mary is called the new Eve. The Church celebrates the Annunciation on March 25th.